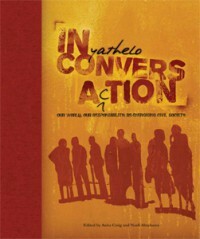 In Conversation is an in-depth reflective reporting of key discussions held at Inyathelo’s November 2009 conference in Cape Town. Using the spoken word, capturing verbatim excerpts of conversation and debate, the report covers inputs on civil society, anchor institutions, philanthropy, and the future of activism, and concludes with a graphic summary of key points and conference quotes. *As part of Inyathelo's commitment to your privacy and in compliance with South Africa's current legislation to protect personal information, we want to assure you that we will never send you unsolicited communications, nor provide any of your contact details to a third party.